Maryland was first settled by a group of mostly English Catholic colonists who established the settlement St. Mary’s in 1634. In honor of the 300th anniversary of this outpost, the Maryland Tercentenary Commission was formed in Baltimore to help plan festivities. As was the norm with the commemorative coin series, funds raised by the sales of the coins were to be used to help defray the cost of the celebrations. 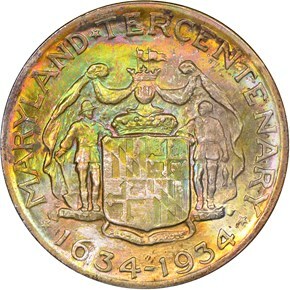 On May 9th, 1934, legislation was passed authorizing the striking of up to 25,000 Maryland Tercentenary half dollars. Sculptor Hans Schuler was commissioned to prepare models for the coins. 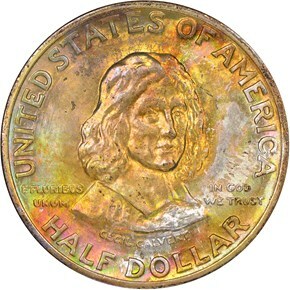 The obverse depicts the second Lord of Baltimore, Cecil Calvert, with his name below. UNITED STATES OF AMERICA and HALF DOLLAR are on the periphery above and below him, respectively. To his left is E PLURIBUS UNUM and to his right, IN GOD WE TRUST. The reverse displays the arms of Maryland, with MARYLAND TERCENTENERAY above and the date 1634-1934 below. 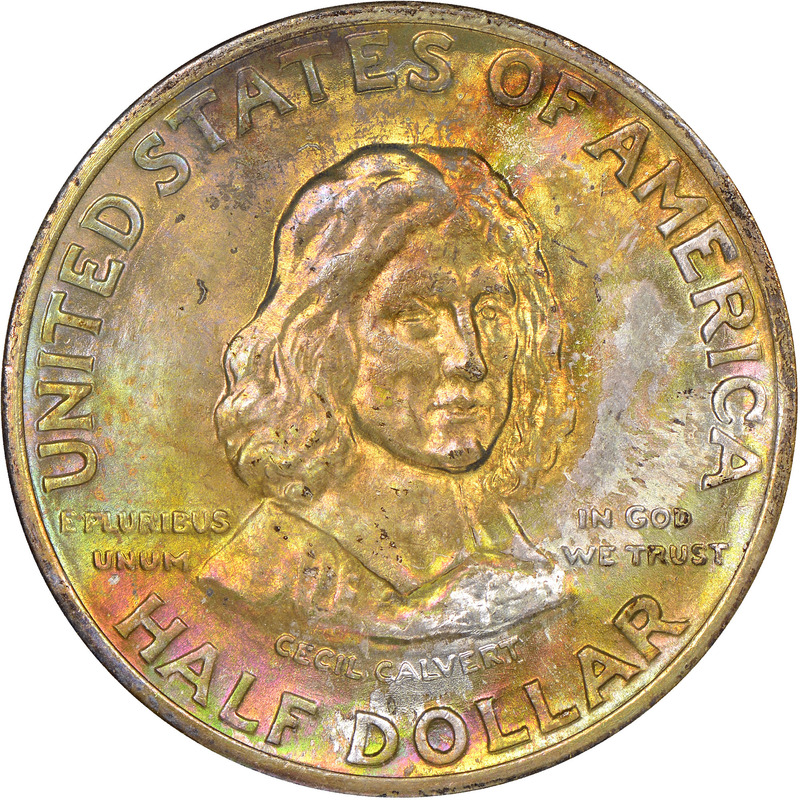 All 25,000 Maryland Tercentenary half dollars were coined in early July of 1934. They were delivered to the Commission on July 10th, and were marketed by the group for $1 each both directly as well as through banks throughout the state. By the end of the year, around 10,000 coins remained, which were sold at ever-increasingly discounted prices until none remained.